How wonderful is that? Some of you may think, duh, but in a lot of parts of the world, and in our own daily grind, we've made getting outside a lot more difficult than we want to admit. But the Japanese were smart enough, since we keep paving paradise to put up parking lots and the like, to turn it into a thing to give us more of a tangible reason and motivation to get outside. Way to go, Japan. 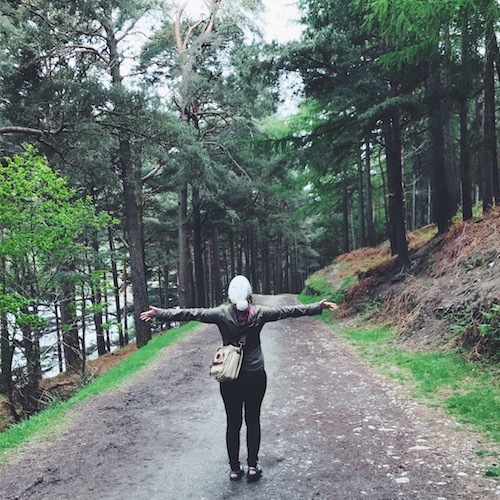 There has been a lot of research done on the healing benefits of simply connecting with nature, and you can read about that HERE if you fancy, but I would bet that you've felt the benefits for yourself. You don't need research study stats to prove it to you. 1. Bundle up. I believe that there's no bad weather, just bad gear, so you can get outside and have a decent time if you really want to. Don't be afraid of a little rain or snow or wind. You are tougher than that. 2. Incorporate it into your everyday life. Park far away in the parking lot. Bike or walk to work if you can. Do yard work yourself. Drive with the windows down. Get a pet that requires outside time. Trade in your end of day T.V. show for a sway in a hammock with a good book or podcast. 3. Walk dates instead of coffee dates. I've done this a few times and each time has been so delightful. You can still get a beverage, but take it outside. Walk around the city or meet at a park. You'd be surprised at how much more enjoyable, productive, and refreshing it is. The key really is to make it a priority instead of a luxury. Embrace that nature is the original medicine and can do so much more than the occasional feel good moment. Let it be part of your therapy by putting your devices away and really taking it all in. Call it forest bathing or going for a walk in the park, take advantage of the medicine around you. No co-pay or coverage required.